Since our November site overhaul we have introduced the “Custom Portfolio Builder”, a basic tool to achieve Portfolio Diversification with our strategies. More than 350 investors have since used it to set up their investment portfolio for 2015. What is the power behind it and how can I maximize the benefit of it? Portfolio Diversification is a cornerstone to successful investing. In simple form, when measurably diverse assets are combined in a portfolio, the investors portfolio risks are reduced without any sacrifice of returns. This is a rare “free lunch”, it is well accepted part of modern financial portfolios, and to stay financially healthy it is important not to skip lunch. When one asset is going down while the other is going up, the portfolios risk is reduced without the normal penalty of risk/return trade-offs. We take advantage of that when our systems dynamically blend things like the S&P 500 and treasury bonds, which often exhibit negative correlation to each other (which is ideal). Our subscribers can take this a step further. Our investing algorithms take on a blend of the properties of their underlying assets combined with the “alpha” edges from the investing rules. The returns of each investing strategy should be thought of as an asset, which are different and unique from the underlying holdings. So holding a portfolio of strategies functions much like holding a portfolio of assets. To evaluate the risk profile of the strategy, we examine the history of the returns of those strategies, much like when holding a basket of stocks the historical returns of each stock would be evaluated. By creating a basket of strategies, if they exhibit diverse returns and risks, we lower the total basket’s portfolio risks, which means improved risk/return benefits for the investor, thus real portfolio diversification. The best practice recommendation for our subscribers is to consider diversifying a portion of their investing capital across several investing strategies. The first instinct is to simply pick the top performing historical strategies. For an advanced investor, smartly thinking about managing risk, it is better to blend in some strategies that have low correlation to other strategies. For a simple example, sometimes equity stocks are more “in favor”, sometimes government bonds are more “in style”. Our strategies work the same way, even strategies with great track records will have times when they do not add as much value. A different strategy, with good history, that uses a different approach and focuses in different asset classes & geography, will often be working well while the first strategy is a bit out of favor. Serial Portfolio Diversification: The nature of our momentum driven strategies, using a horse race analogy, is that they try to always win the race by hopping constantly on the fastest horse, e.g. the early leader might get tired mid-race while a former lagger catches up. Applying this analogy back to the investment world, a strategy switching between globally diversified assets and ‘naturally’ low correlated instruments like treasuries, bonds and commodities will in average benefit from lower correlation to a market index like the S&P500. This is what we call “Serial Diversification”, e.g. the monthly switches reduce the average correlation profile of our strategies. You can easily see this in below chart which shows the 120 days correlation of some of our strategies versus the S&P 500. During prolonged up-times in the equity markets they positively correlate with the index, while during market corrections they exhibit low or even negative correlation, thus offering crash protection When the lines are at the top, they strategies were highly correlated with the S&P500, when closer to the bottom, they are negatively correlated. Cross-Strategy Portfolio Diversification: When blending our strategies into a fixed weight portfolio you benefit from the less than 100% correlation between the strategies. The different instruments and algorithms used in each strategy cause it to behave in a unique way in different market environments or regimes. As an example see below the cross-correlation between the Bond Rotation Strategy and ‘BUG’ Strategy with the Maximum Yield Strategy from the 2011/12 Europe Sovereign Debt Crisis to the end of 2014, including the turbulences in the second half of 2014. While the Maximum Yield Strategy had a maximum drawdown of 14% August 2012, the Bond Rotation Strategy and the ‘BUG’ had new highs being up 10% and 6% in the preceding five months. The correlation matrix in the portfolio Builder shows the correlation between strategies and some common market proxies for the time period from Jan 2008 to Dec 2014. When using it you need to keep in mind that this as somewhat static snapshot, including the worst financial crisis, but also one of the best bull markets in history. It is important to note that these portfolios are constructed with perfect hindsight and limited to a 7 year test period during which one of the longest bull-market in the US history occurred. These portfolio have been calculated using non-linear solving techniques and the weights have been rounded to the next full 5%. As such, use them as aid for constructing your own portfolio, but recognize that such perfect conditions will not be met in the future. Minimum Variance (Volatility) Portfolio: This portfolio with the lowest possible average volatility during the time period of only 5% might be of interest for investors who anticipate turbulences and are looking for stable growth while ‘sleeping well’ at night. Maximum Sharpe Portfolio: With a Sharpe Ratio of above 2.3, this portfolio historically would have given the best Risk/Return profile by using at maximum the correlation profile of the underlying strategies. Depending on the market environment this portfolio has held positions in up to 10 ETF, offering a bond like volatility of 8% with an annual return of above 22%. Highest Annual Return (CAGR) with a bond like 7% volatility: By switching to defensive global sectors or assets during market corrections it achieved a compounded annual return of 16% with a bond like volatility. Highest Annual Return (CAGR) with a SPY like 15% volatility: This is a typical application of a “risk/return” target portfolio and an example of how investors could use it in practice. Identifying our own risk “appetite” we strive to maximize our return. The volatility target of 15% is chosen as example. The same could be done for let’s say 8% or 20% target volatility. Note again this is the volatility over the whole period. More advanced techniques with annual or even quarterly volatility targeting will be included in one of the strategies we want to release in the next months. To set these portfolios into perspective, here an overview of the Risk/Return profile of portfolios, our strategies and the market proxies. In conclusion, using our ‘Custom Portfolio Builder’ allows you to set up powerful asset allocation scenarios using our strategies and achieving Portfolio Diversification. We hope this post aids you in building your own portfolio using above examples as framework and inspiration. As you can observe, very attractive portfolios can be build applying only two or three of our strategies. Or consider our “All Strategies” package, which gives you access to all our 8 current and all future strategies at an annual cost-ratio of 0.4% considering a 250k USD portfolio. Correlation, especially in such a static view, is just one of the building blocks to a rock-solid portfolio. We have briefly touched here on our current work in progress to more adaptively allocate assets in a single-strategy by using minimum variance optimization – a variation of the Modern Portfolio Theory. For further optimizing a portfolio of strategies we are in parallel working on what we call a “meta-strategy” which allows adapting the portfolio more flexibly depending on how strategies behave in different market environments in terms of performance, volatility and correlation. Let us know if we can support you in building other portfolios or provide more background information. Looking forward to seeing the “meta-strategy”. Ed – very interesting perspective and I think I may agree…..I look forward to Logical-Invests response. Ed, thanks for your comment, gives me opportunity to expand on the topics you mention. Some of our subscribers have an existing portfolio, either in an IRA or a savings account, and simply choose one of our strategies to complement or ‘spice’ up their overall risk/return profile. Now, when selecting this individual strategy the ‘rational’ risk/return maximization is not the only criteria investors use when comparing our strategies. In some accounts the volatility or short ETF might just not be available, or people do not feel comfortable using them. So GMRSE or MYRS may just not be a choice for them, or they just miss an attractive bond strategy and go for BRS. The other group of subscribers allocates a major part of their portfolio in our strategies. For them finding ‘their’ optimal portfolio in terms of risk appetite and then maximizing return is more important. Here is where the ‘Portfolio Builder’ really comes to play as it allows you to build any portfolio on or below the imaginary ‘efficient frontier’ on the risk/return matrix above – to use MPT terminology – instead of just following one of our strategies with a ‘fixed’ risk/return profile. Is this going towards classical 60/40% or x/y% portfolios using single equity/bond/treasury ETF as you imply? I owe you the ‘efficient frontier’ lines using single ETF versus our strategies, but just visually I think there will be a nice difference. Your point of rotating ‘sequentially’ through our strategies is basically what we mean with our ‘meta-strategy’ approach: Taking benefit of the different performance of each strategy depending on the market environment / regime. Just picking the best each month most probably will lead you into whipsaw effects and might not be optimal, but what if we apply the same momentum logic as in our strategies and Select Top1, 2 or 3? What about systematically over-weighting the winner or opposite ‘buying the dip’ in a mean reversion style? 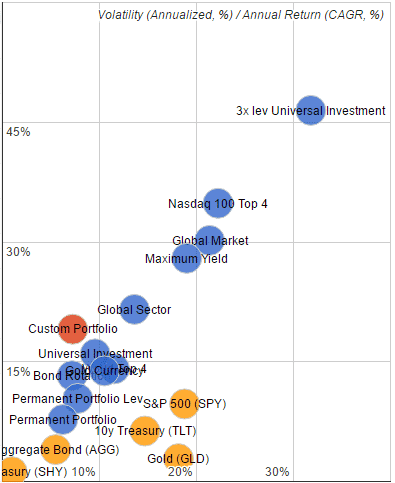 What about choosing the Top3 with lowest market or cross-strategy correlation? These are some of the things we have on the burner and happy to learn what you are looking for. Finally, agree that managing a ‘multi-strategy’ portfolio is more time consuming. We’re looking into how to ‘consolidate’ our monthly information mails across strategies, so you would get a simple summary allocation % by each ETF in your subscribed strategies beside the individual signals. Also here need to ask you for some time, and feedback on what would serve you best. Hope this answers a good part of your comments, let’s keep the discussion flowing as you touched a crucial point for many subscribers. I doubt that one uber strategy will satisfy all investors. Everyone has different goals, risk tolerances, account sizes and time available to manage their investments. But, I do like the idea of offering a few different strategy bundles as you have shown above. I also like having multiple strategies to choose from because it spreads the risk. There is no guarantee that a particular strategy with the highest CAGR in back tests will continue to be the best for future markets. If you put all your eggs in one strategy the risks of a major setback is much larger. Most of the current strategies have 40-70% allocated to treasuries (TLT or EDV), so even if I have a mix of strategies my overall portfolio is still going to be 50-60% in treasuries. That seems like a large allocation to one asset class. Do you feel that it is acceptable? Thanks for the thoughts, comments and good debate. Our approach is built on the cornerstones of creating statistical models that will learn and adapt over time to what has worked in the longer term and what is working more recently. One of many alternative approaches is more like the Harry Browne approach of a long term fix allocation forever (” take care of you for the rest of your life”). Many of our algos are now saying that US treasuries have been working for a long time, the market has become increasingly risky recently, and Treasuries they are working right now. If the markets settle a bit, the models will “rotate” out of treasuries. Are high allocations to treasuries the right answer for the long term . . . probably not, and I really have no clue. We work hard to add value and adopt about one month at a time. Patrick, you said it very well; we have a wide variety of people with different needs, different income/savings, risk tolerance, belief sets, etc. We are not trying serve all needs, and we certainly do not advise to an individual’s situation, we just work to provide models that give diverse solutions for better risk/return trade-offs. Personally I am more comfortable with the one month period for strategy review that Mr. Grossman optimized with his research. Also, I feel the L.I. business plan is closing in on the sweet spot that I am looking for with my all-in, all strategies subscription. If there was anything learned from my years in the market, it was an appreciation of what would not work versus what had meaningful potential. It seems that these strategies, with their transparency, new depth provided by the partnership arrangement, and ongoing evolution of new variants have that potential. William, thanks for your comments. In the examples above I had shown one targeting a 15% volatility and maximizing CAGR. Based on your comment, here the other way around: Which is the portfolio that would have delivered a 20% CAGR with the lowest possible volatility. Again only a backtest using perfect hinsight, therefore additionally a 25% CAGR with lowest volatility example. In both weightings are rounded to next 5%. Thanks for the examples. Good information. Monthly vs quarterly vs daily, etc. I have fairly thoroughly tested a lot of combinations of “alpha edges” similar to what we are using in daily vs weekly vs monthly vs quarterly time frames. Generally as you update/trade a solid system that adds value more frequently, you do a bit better (sometimes a good deal better) and as you go longer between re-balancing /adjusting you give up some advantage, but it still adds value. However, the more you trade as an investor, you have slippage, maintenance and time costs, might miss/skip a trade, etc. So we believe for your average investor, monthly is a good trade-off and sweet spot. Quarterly would usually be not quite as good a return on average – but might be preferred by some people and we will consider that option. Additionally, for those with the time, focus and active trading execution comfort, we will likely offer an approach that takes advantage of very short term market moves and possibly individual stock signals. Ed, It’s obvious you are not a serious commenter here. End of discussion. Ed, this may not be for you. If you can’t roll your old 401k into your IRA to make life simpler and once a month login, read the LI symbols and allocation, do some basic math (ie my account total/amount into XYZ) and put in an order once per month for a few accounts then as a seasoned investor you have to do what you feel is best and are most familiar with, even if it may not have anywhere near as good risk/reward. Quarterly is not often enough and Alex (and many other in this space) shared his thoughts after testing this. I of course don’t know what work you did to generate these funds but outside of celebrities, heirs and other easily received funds, managing your money is far less work than earning it. As well, if you can’t understand how combining strategies with different approaches lowers overall risk due to non-correlation then, if you care to move forward in your level of wisdom, research non-correlation benefits. It is the same principal that MPT uses albeit on strategies vs. asset classes. I find it amusing as well that you ridicule William for targeting (he didn’t say he needed btw..) 20% return when Alex’s CP#1 to achieve this takes on less risk (over half!) than the S&P 500. It is also amusing that you say “requires a substantial amount of risk” when, very clearly and detailed, Alex and LI have demonstrated how to have less risk. Go check your average bond fund that lost over 20% peak to trough in ’08 era. You’re thinking in an old paradigm and applying it to this process. This process will stall and not work every month but over time, you will have far great reward for the risk taken than many other methods. That is what is great about this endeavor, many will have doubt and, at their own expense, have more faith in talking heads, wall st.’s conflicted shark pits etc. so this is not for the masses but can benefit those who see the validity of the process. Thank you for the post. You summed up my position as well as or better than I could have. I also saw older paradigms being applied in the comments to the article Mr. Grossman first published on the Seeking Alpha website. I even saw another website with an entire section devoted to trying to disprove Frank’s work. I corresponded with others in S.A. and saw much skepticism. Often, they abandoned the concept at the first monthly loss. As you state, those doubters will do so at their own expense. Investors have to be able to realize the “validity of the process” I certainly have. Glad to have a forum to engage with others about this. We’re all trying to grind out something a little extra. I have worked at trying to code my own system on amibroker for over four years with nothing ready for production still. This is how I know Vangelis as his blog showed he can develop, code, think deeper, display his efforts to an impressive degree. From the spectrum of investment providers, ranging from GS/MS- largest and most “sophisticated” firms to pikers on yahoo forums, from my decades of observation/participation the most value can be found from those driven to do it for themselves and potentially new to making it available to the public. The criteria being effective, affordable and useable. This is where LI is right now. Hard to imagine someone being more skeptical than I am but, one has to compare all the available choices out there to put money to work. I think I have explored most all paths out there. Ed’s systems work for him and if he has a better system that he can use then he ought to cxl his LI subscription. Since he is critical of the bond strategy he is subscribed to, and is making money with, I suggest he put forth something better. Looking forward to a L.I. strategy based on short term market moves. Perhaps a very small fraction of my portfolio in such a strategy would satisfy my counter-productive urge to trade the main portfolio too frequently. William – Thanks for the encouragement and the chuckle, will keep you posted. hawaiianwaverider – Per your AmiBroker comment. I started with a variety of tools, migrated to TradeStation testing (still use it, but not as a development platform), migrated to AmiBroker 5+ years ago which I loved. Last year pushed myself to get deeper into Quantshare, which has a stronger set of tools, but a bit harder to fully learn. Like some studies have shown, in takes about 10,000 hours to become really good at anything that is challenging.